T.S. Dharmarajan, MD, is the Clinical Director, Division of Geriatrics and the Program Director, Geriatric Medicine Fellowship Program at the Wakefield Campus of Montefiore, the university hospital of Albert Einstein College of Medicine. He is currently Professor of Clinical Medicine, Einstein, and also an Adjunct Professor of Medicine, New York Medical College. Dr. Dharmarajan is certified by the American Boards in Internal Medicine, Nephrology and Geriatric Medicine; he has been a Fellow of the American College of Physicians, Fellow of the American Geriatrics Society and a member of the American Society of Nephrology. In April 2013, he was awarded the prestigious Mastership of the American College of Physicians, an honor accorded only to a handful of physicians in the country each year. 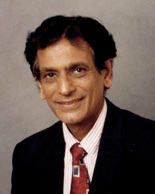 Dr. Dharmarajan was instrumental in developing a large inpatient geriatric medicine program at Our Lady of Mercy Medical Center in the Bronx (currently Montefiore Hospital, Wakefield Campus), with recognized clinical, academic and research components, including a fully accredited fellowship program in Geriatrics with a maximum complement of 10 fellows. Dr. Dharmarajan co-edited the textbook Clinical Geriatrics (CRC Press / Parthenon Publishing) released in 2003. He co-edited his second textbook, Geriatric Gastroenterology (Springer), released in July 2012. Dr. Dharmarajan has authored 23 and 17 chapters respectively in the two books. The latter was a best seller in the Springer category of textbooks for 2012 and 2013. His publications in peer-reviewed journals and textbooks total nearly 200. He has about 500 scientific presentations (abstracts) in inter-mural, county, state, national and international meetings. His research interests focus primarily in the areas of geriatrics, nutrition, anemia and anticoagulation. He has been a Principal Investigator for several research projects, including national studies for the AMDA Foundation. Besides winning the Howard Gutterman Award for best research project in the Annual AMDA (2006) meeting, several abstracts were winners in state or national society meetings. Dr. Dharmarajan is a regular speaker at local, national and international meetings. Some of his numerous recognitions and awards in Medicine include: "Teacher of the Year"; "Peer to Peer" recognition by the Bronx County Society; Dedication as Teacher and Mentor to young Physicians in the Bronx (from American Assn. of Physicians of Indian origin), Unparalleled Leadership in the Medical Community for medicine and research (from the Bronx County Society) and others. In April 2013, he was featured on the cover of AgingWell magazine, as one of five noteworthy geriatricians in the country. From 2010 to 2013, Dr. Dharmarajan has been the President of the Montefiore Physician Council (Wakefield Campus) and a member of the Montefiore Executive Committee.